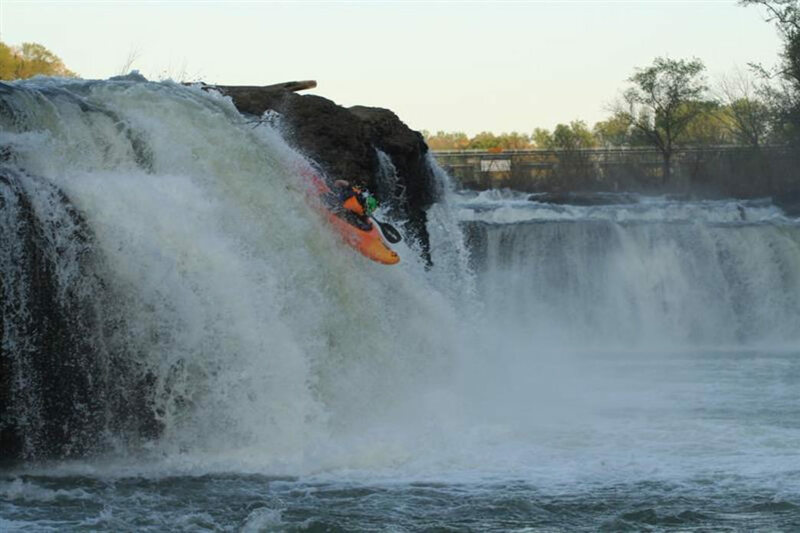 Rock Island offers world class surfing and waterfall hucking, where experienced paddlers love to test their skills! Rock Island State Park in Tennessee is located 81 miles from Chattanooga, and 87 miles from Nashville. The drive from both cities takes about 1.5 hours. Getting there from Chattanooga on Highway 111 yields exceptional, panoramic views of the Sequatchie Valley, Walden's Ridge, and the Cumberland Plateau along the way. The Caney Fork River, impounded by the Great Falls Dam, is the main attraction at Rock Island. Combining some unique geology with abundant gradient, Rock Island boasts an exhilarating combination of whitewater scenery and experiences, from waterfalls to surfing, that captivate and appeal to paddlers of many skill levels. 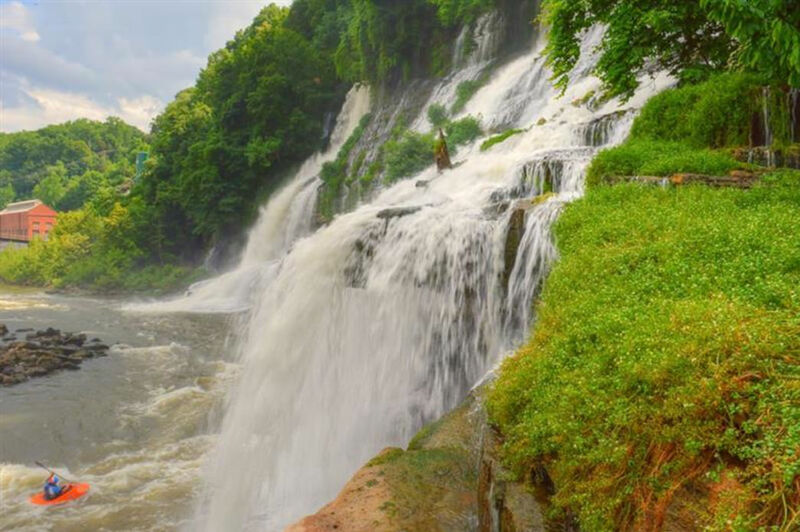 Teeming with numerous riverside cliffs veiled in falling water with easy viewpoints, the Caney Fork at Rock Island entices plenty of hikers and onlookers too. That being said, it's never too crowded, and the perspective is best from the water level. It's a great destination for a short day trip or an afternoon, whether your goal is to park and play, park and huck, or simply paddle downstream. Water access is abundant, and the entire stretch can be completed in less than one hour. On a typical day, the generators release one or two units, forming several deep class III-IV rapids with nice surf waves and a fluffy hole. The hole gets progressively larger and stickier as the water level rises. When the dam is spilling after a heavy rain, bring your creek boat. The upper section's 20 foot waterfall is a popular 'park and huck' if you've got the skills and experience. Scout thoroughly and portage the obvious class V below on river left. Paddling down to the boat ramp is fun and possible at every level in winter. Paddlers should be aware of several undercut walls on river left, and especially avoid the bottom left of the rapid below the main hole. Enjoy the rest... the bottom rapids stack nicely with sweet wave trains! 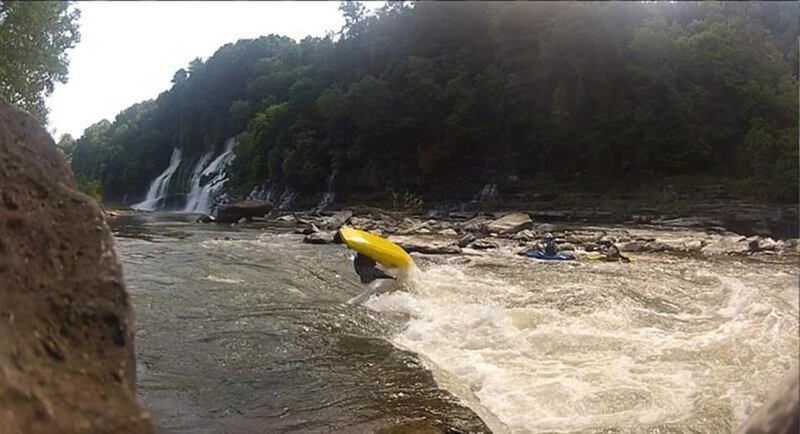 Rock Island local and pro paddler Clay Wright has this to say: "The park and play surf is good from November to July most seasons or anytime after a good rain. With levels typically ranging from 1500 to 8000, the 'twin falls' area is the place to be, with fun surf waves and a big fluffy hole to surf. Upstream, which is below the dam, the water starts flowing at 4200 CFS leading to a perfect 20' falls. While multiple lines open up with higher water, some of these land on rocks, so be warned. At higher water, a dangerous hydraulic forms below the drop. Just downstream lies ''Seive City'' (class V) which is best run to the left at levels of 4200 to 6000, but higher water descents of up to 50,000 CFS have been done successfully." Be aware that the bottom lake can be backed up and flood the last 2 rapids in summer. The water release schedule can be found here: TVA.gov. Generally, bring a play boat. This is a popular freestyle paddling destination for all skill levels. 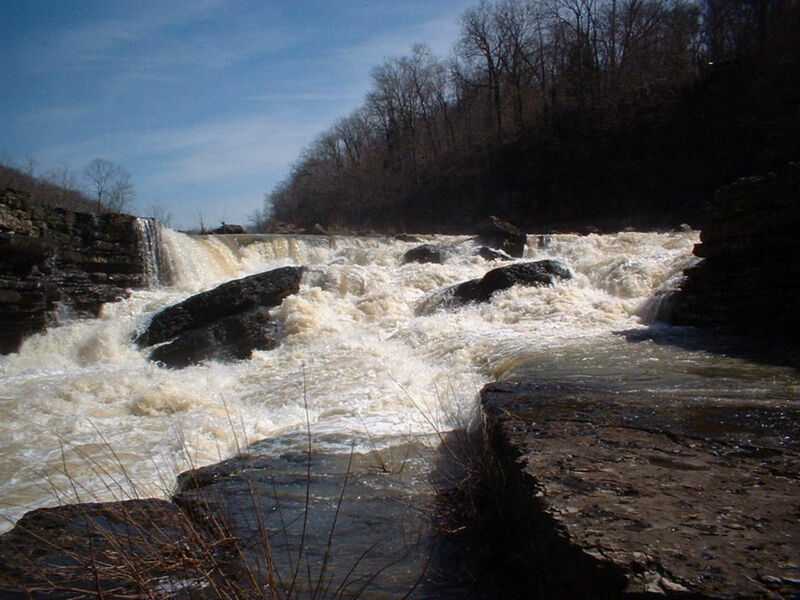 The rapids range in difficulty from class III to class V. A few SUP paddlers and squirt boaters have been known to frequent Rock Island too, but in order to paddle here, boaters should have a roll and be able to identify the obvious hazards. Take a look and quickly determine, at a glance, whether the hazards present a challenge. If they do, stay on the shore. Swimming at Rock Island is not a safe activity. Park at Rock Island State Park, ''Twin Falls Overlook'' for the park and play location. Walk down the stairs and choose your trail to the water. On the other side of the river, upstream from the park, there is an overlook at the ''Great Falls Picnic Area'' with access to the upper gorge, also by stairs. In order to paddle all the way down (2 miles), drive to the main entrance of Rock Island State Park and follow signs to the boat ramp on Center Hill Lake. That is the final take out point. There are no fees to paddle, leave your car, or enter the State Park, unless you are camping.